2. Say: I seek refuge with the Lord of the Dawn, 3. From the evil of that which He created; 4. From the mischief of Darkness as it overspreads; 5. And from the evil of those who spit on the knots, (i.e., perform malignant witchcraft). 6. And from the evil of the envious when he envies. This chapter (surah) was revealed at Mecca at the beginning of Islam and it gives us an antidote, a solution to fight against the works of the satans (i.e. evil works), superstition, and fear; for it teaches us to seek refuge in Allah against all kinds of evils which may exist on earth, visible or invisible. One example is the plots which people can make to harm others. Thus this surah is also a remedy against the envy and jealousy of other people. It is Allah Who drives away all obscurity/ darkness when He sends His light, and it is Him Who gives life to people and make them feel that they are truly alive, be it physically and spiritually also, after having gone through a spiritual death. Life and death forms part of a cycle which is in the control of Allah, in the Hands of Allah. It is Allah Who has the capacity to annul all satanic works, and all fears which people use to make you fearful, and this materialises when He sends His spiritual light. Man needs to repel his fear and put his complete trust in Allah. No harm shall befall him when he is found in the protection of Allah, and when he has Allah with him, as his Mighty Help, then no Satan can ever deviate him with its falsehoods to make him and other people become fearful and to lose their trust in Allah. 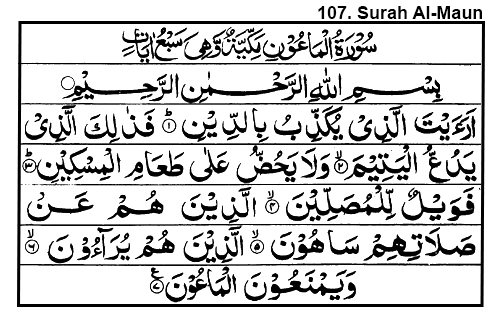 This surah is a duah (prayer/ supplication) addressed to Allah to ask Him for His help and protection against the evil/ wickedness of ignorant people and those who plot to harm others with their tongues, hands, scheming and backbiting. Man need to seek divine help and protection against jealous hearts because a jealous heart is indeed very dangerous. Why? Because jealousy is found therein and this jealousy eats away that heart little by little and makes it become dark. It works silently as a harmful device to strike physically or morally at that jealous person. 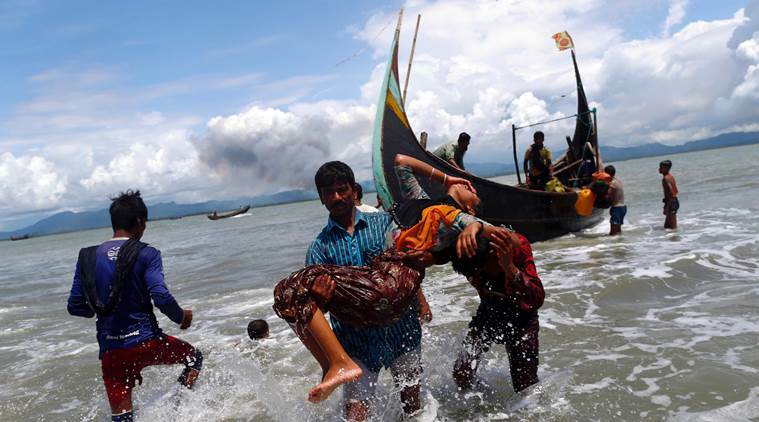 With the exodus of hundreds of thousands of Rohingya Muslims of Myanmar (Burma) under conditions of intense distress occasioned by the brutal military crackdown in the country, a humanitarian catastrophe is unfolding in South and South-East Asia. 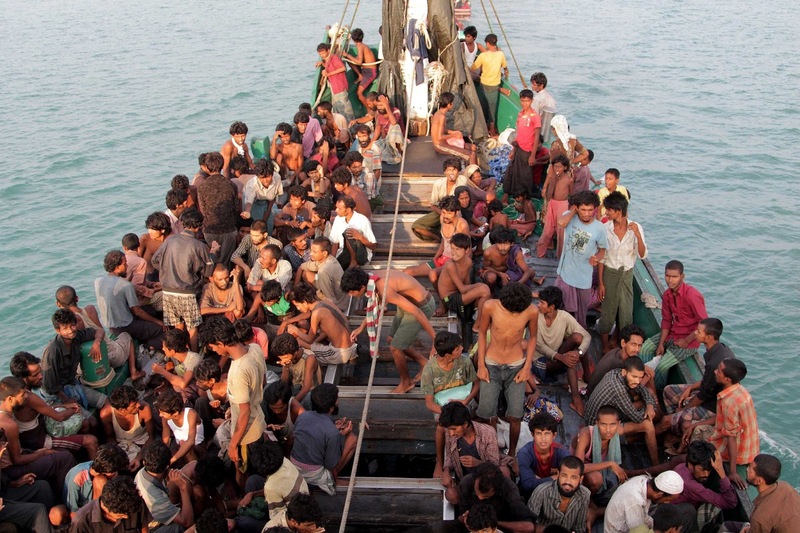 The UN agencies estimate that close to half a million Rohingyas have become refugees in the last three weeks alone, with the pass over of the people fleeing violence in Myanmar to Bangladesh and India, and also seeking to reach to Malaysia and Indonesia through the sea. The crisis is a direct consequence of the disproportionate and wanton use of force by the military in the so-called "counter-terror operations" in the Rakhine State where the majority of the Muslim people live and face acute discrimination over the decades. 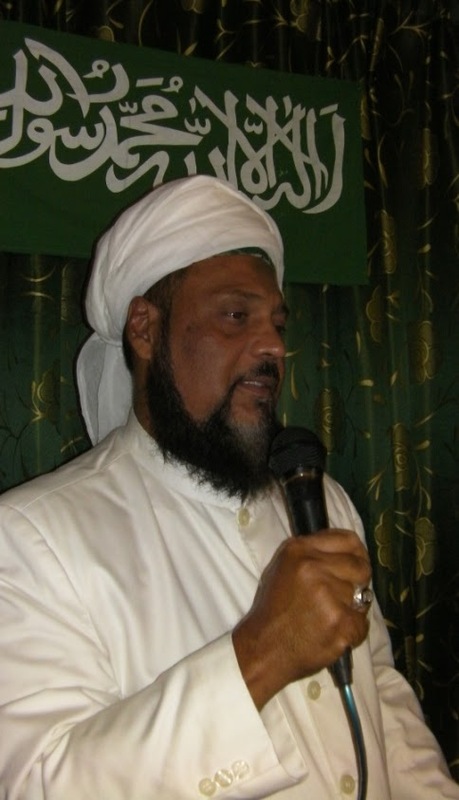 In a special discourse/Message issued against the backdrop of the ongoing persecution of the Rohingya Muslims, the Muhyi-ud-Din Al Khalifatullah Hadhrat Munir Ahmad Azim Saheb (atba) of Mauritius reminds us of certain important considerations at the heart of the humanitarian problem engulfing the international community. Anyone who is interested in world peace and believe in our common humanity and shared future in a multi-cultural world (of different nations and diverse religions in co-existence) can only applaud the spirit of the Message of Hadhrat Khalifatullah (atba). 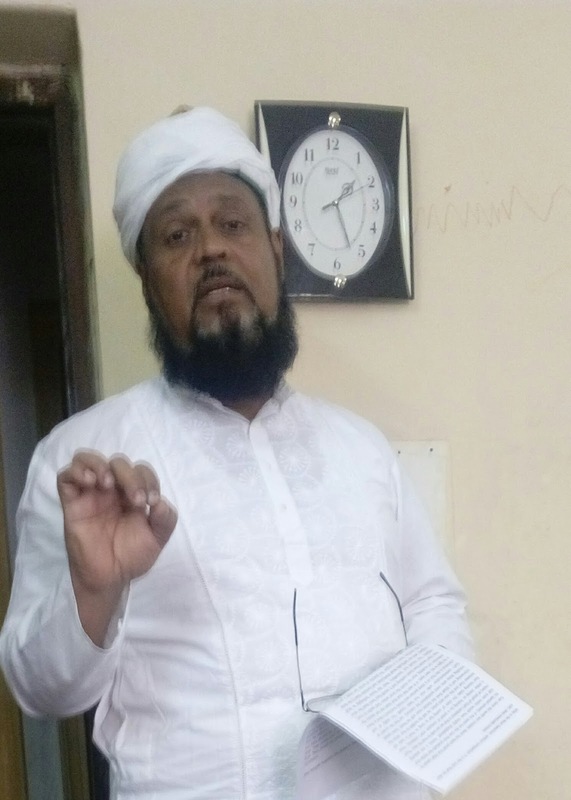 As Hadhrat Saheb (atba) notes, the Rohingya humanitarian crisis is happening against a backdrop of "Islamophobia" (fear of Islam and the Muslims) in the contemporary world. The international backlash against the horrendous 9/11 terror attacks in the United States- executed by people avenging the US onslaught on the Muslim world- has created political conditions in different nations that de-legitimize the liberation struggles of oppressed peoples. Hence, post 9/11, robust political struggles are under intense pressure from the politics of framing and media- creation of negative perception: most political struggles taking the garb of "Jihad" in the cultural language of the Muslims, have been negatively branded and media-framed as "terror" operations. Mindless violence targeting innocent civilians also contribute to the stereotyping of Muslim resistance groups as cults of violence and mayhem, providing the perfect excuse for the governments to suppress legitimate political struggles in the pretext of 'national security' and "war on terror". The failure of religious and political leaderships in guiding the people to the right course of action is apparent in all the 'fires' that are simmering around the world. Just as the Muslim Ulema have abandoned the Qur'an and distorted the Islamic teachings in our times; the Buddhist clergy and political leaders in Myanmar are also guilty of destroying the fair legacy of the Buddha and his teachings on peace and human relations. There is an urgent need for the priests and chiefs (of the different religions and their nations) to return to the foundational values of their respective cultures: protection of the innocent and helping the indigent is a religious and political duty- an obligation of our common humanity. 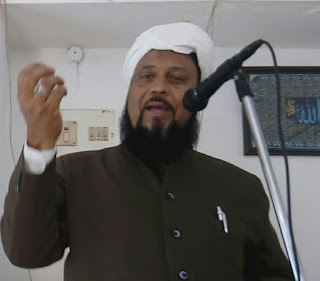 Directly addressing the Myanmar leadership responsible for the 'ethnic cleansing'/genocidal crimes against the Rohingya people, Hadhrat Khalifatullah (atba) delivers a note of caution and warning: Governments and leaders who preside over the egregious violation of fundamental human rights and oppress the poor in God's earth shall be condemned and pursued by the long arm of Divine Justice. May the peace and blessings of the Almighty (Allah) be upon you. 4. Then celebrate the praises of your Lord, and pray for His Forgiveness: For He is ever ready to accept repentance (of His servants). (An-Nasr, 110: 1-4). 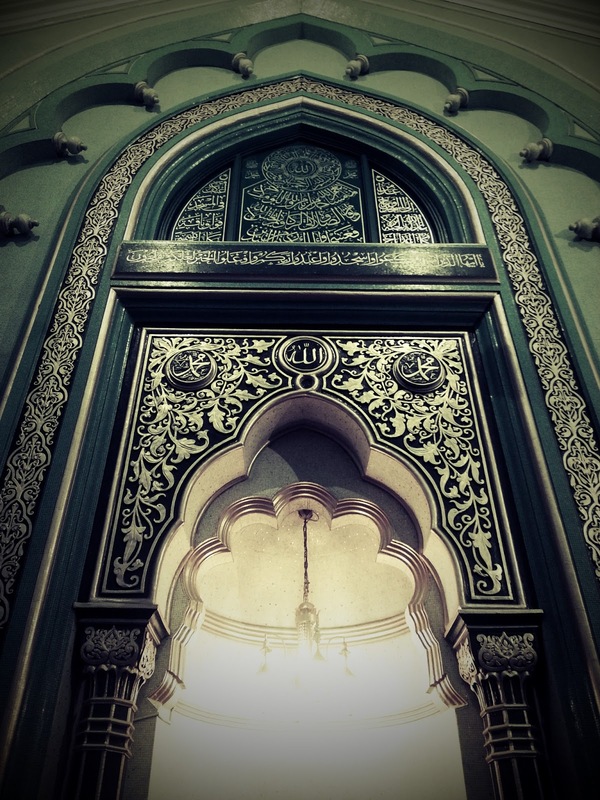 This beautiful chapter was the last to be revealed to the Holy Prophet Muhammad (pbuh). It was revealed approximately some months before his demise. The revelation of this Quranic chapter happened either in Mecca when he went to accomplish his last Hajj or in Medina when he returned. Victory is the result of the accomplishment of a supreme and final duty and it is also a result of our foremost duty to Allah, and thus we need to ever take it seriously. All victory can ever become possible only with the mighty help of Allah. The help of Allah and victory are ever near for him who is always righteous and good! When the soul attaches itself to Allah and His Messenger, and it unites with others who have faith, therefore, come what may, they fight against falsehood and the miscreants (Kafirs) with all their capabilities/ strength and they humbly carry the flag of faith and they march forward with certitude towards victory; such victory which comes from Allah only. It is to Allah that we need to seek help and it is verily Him who comes to our rescue in all circumstances when we turn to Him with sincerity and it is Him who turns to us with His pity and mercy. 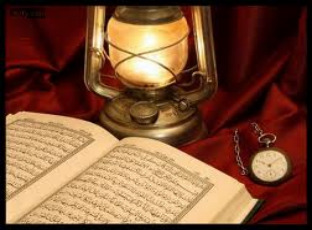 The Holy Qur’an is an ocean without shore. (18: 110; 31:28) For, the Book of Infinite and Eternal Wisdom in the Arabic language, encompasses within its wide-ranging verses, a world of profound explanations on several matters. Further, the Sublime Book with its inimitable literary style and reasoned argumentation, offers a fascinating glimpse of the ways of the Divine: a human mind can only marvel at the depth and reach of the Divine Book. The Qur’an remains a stunning testimonial to a Living God in complete control of the Universe around us and its clear guidance offers the extraordinary possibility of acceding to the exalted Divine presence for all hearts. Those who plunge into the sacred text with a purified spiritual perception, shall find pearls of wisdom, illuminating insights and clear guidance on the ultimate questions of our existential, spiritual and ethical universe. Consider the diversity of human experiences in the world. How do we comprehend/understand the Divine Will at work in the world around us? How do we explain the contrasting fortunes of fathers and sons who follow different trajectories in exercise of their God-given Free Will? What role does soulful prayers play in the shaping of the destinies of individuals and spiritual communities? How to look at the (non-)linear linkages between spiritual legacy and physical progeny? Several verses of the Qur’an allude to the many phenomenon of nature and the creation of the human beings in a variety of settings: races, languages, religions, cultures and nations. Indeed the Qur’an cites the creation of the humans, from the humble ‘dust’ and the modest ‘clay’, as a fascinating sign of the complete Power and Lordship of Allah (swt) over all things in all the worlds. The plurality of the humans is described as a Divine Sign: 'One of His signs is that He created you from dust and- lo and behold! -you became human and scattered far and wide'. (30: 22). 1. In the Name of Allah, the Most Gracious, the Most Merciful 2. Have you seen him who denies the Judgment (to come)? 3. Then such is the one who repulses the orphan (with harshness) 4. And does not encourage the feeding of the indigent/ poor. 5. So woe to those who pray, 6. but are heedless of their prayer; 7. those who are all show (i.e. do their prayers and other good deeds for the eyes of people). 8. And refuse (to supply) (even) neighbourly needs. 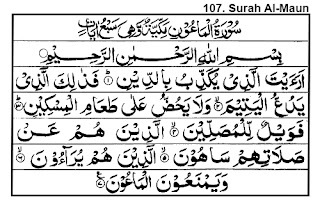 This chapter deals with the meaning and real way of praying Allah. We need to have a firm conviction and attention during our prayer; we need to have a practical mind and a sincere will by helping others. It is with an absolute sincerity and not with an arrogant mind as a way to show-off that all Muslims need to demonstrate whenever they are accomplishing their devotions and charities. All devotions/ acts of worship shall be rendered vain if we do not put all our heart, soul and conscience towards their fulfilment. We have to perform our prayer with sincerity, understanding and a spotless (clear) concentration. The word “Diin” here means: (1) Judgement Day, taking responsibility in the moral and spiritual worlds, for all deeds which men accomplish, or (2) Faith, religion, the principles of good and evil in spiritual matters which are very often in conflict with egoistic desires and personal preferences (of people). It is those who reject faith or the subsequent responsibility who treat the weak ones with contempt and it is them who lead their lives with egoism and arrogance. Allah loves us all. Why should we then have contempt for the weak and poor? 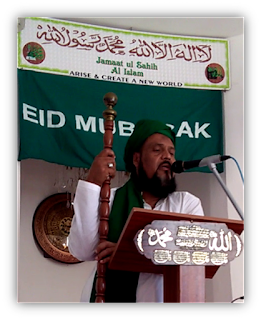 (A special message of Muhyi-ud-Din Al Khalifatullah Hadhrat Munir Ahmad Azim Saheb (atba) on the occasion of the Eid-ul-Adha, was published in two newspapers in Mauritius on Friday 01 Sep. 2017: Le Socialiste (Pg. 2), Le Mauricien - Forum (Pg. 15). Since time immemorial, men have always been making sacrifices, all for the cause of God Almighty. All religions in the world teach sacrifice for the sake of God and the goodwill of humanity. Likewise, the Muslims also, in the spirit of the Eid-ul-Adha festival are called to do such sacrifices which would assure them the pleasure of Allah if done with sincerity, purity of body and mind; such selfless sacrifices which would be an example for all humanity to follow. 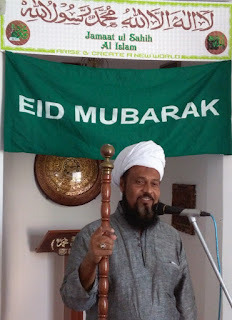 Eid-ul-Adha commemorates the great sacrifice of Hazrat Ibrahim (as) and Hazrat Ismail (as). It is indeed Hazrat Ibrahim (as) who accomplished all rights of fidelity. He could not have become an intimate creature and servant of Allah, were it not for the sincerity, cleanliness and purity he displayed, and it would have been difficult for him to arrive at such stage (in the eyes of Allah/ in the realm of spirituality). To fulfil all rights of fidelity, Hazrat Ibrahim (as) had to make such efforts to purify his heart and remove all 'Ghairullah' (all that is not Allah) and filled it with the love of Allah and act according to the will of Allah. 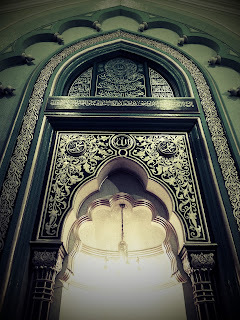 Hazrat Ibrahim (as) had persevered in this path and showed himself ever firm, to such an extent that he once dreamt that he was sacrificing his son. 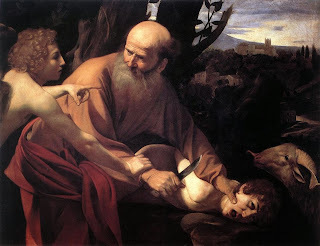 So, concerning his dream, he could have given it several interpretations, but his faith in Allah was so firm that he decided to go through with the literal sacrifice of his young son, with his own hand. Ponder over this. Imagine the state of a person if his son suddenly dies due to some illness. That person can reach such stage where he starts to have all kinds of doubts on Allah, and thus he opens his mouth to utter countless complaints and objections against Allah. So, Hazrat Ibrahim (as) crushed the love he had for his son and above all preferred to show his love for Allah (swt). This kind of person, Allah does not let him lose anything and he becomes the friend of Allah. When you read the Holy Quran, you see how much love he had for Allah (swt) and Allah (swt) in return gave him lots of revelations and granted him, in his progeny, prophets. Both his sons Ismail (as) and Ishaq (as) were prophets and through them (i.e. their bloodline), many more prophets came. In the example of Hazrat Ibrahim (as), there is a lesson for all humanity; a lesson of sincerity and faithfulness. That is why Ibrahim (as) has been qualified as the one who showed faithfulness (fidelity) and sincerity.